Japanese early - mid 1900's SUISEKI viewing stone entitled "Spring Sea". The stone was found at Abekawa in Shizuoka Prefecture. The stone is Yama-Aoi stone. The viewing stone measures 11" L by 2" H by 6" Width. Comes with wooden storage box. 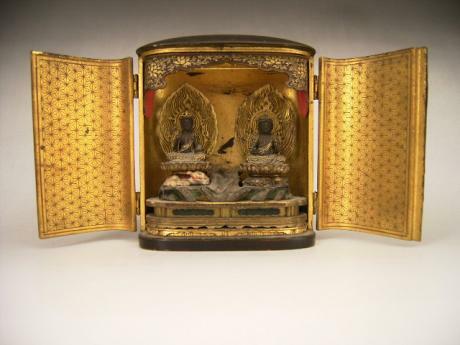 Japanese late Edo Period ZUSHI containing the FUGEN and MONJU BOSATSU. FUGEN BOSATSU is seated on the elephant on the left and MONJU BOSATSU is seated on the SHISHI on the right. FUGEN is the BOSATSU of good conduct the MONJU is the BOSATSU of wisdom and education. Carved in fine detail. 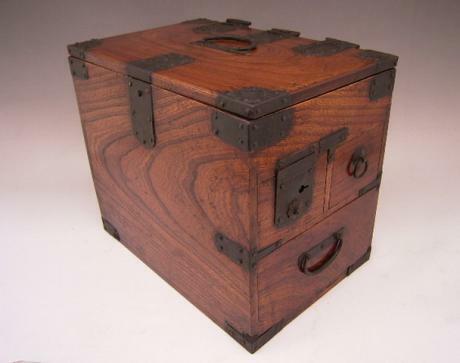 The Z..
Japanese Meiji Period wooden calligraphy box with hinged top and 3 drawers. 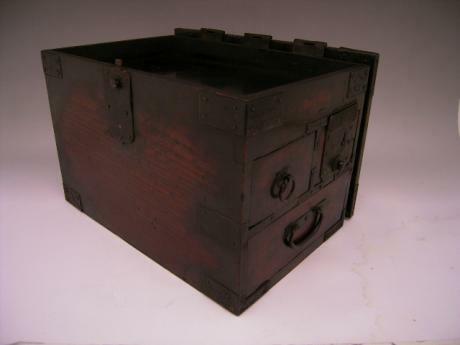 The box has the name of the town, Miyatamura, of the original owner written on the bottom of the drawers. The calligraphy box measures 11 1/2" long, 7 1/2" wide and 10" tall. 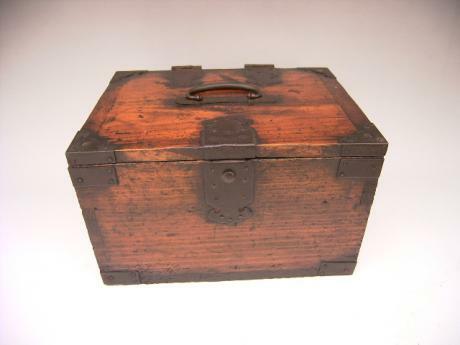 Japanese Meiji Period wooden calligraphy box with hinged top and 1 drawer. The box has the character CHO or NAGA imprinted on the bottom. The calligraphy box measures 9 1/2" long, 7 1/4" wide and 6" tall. 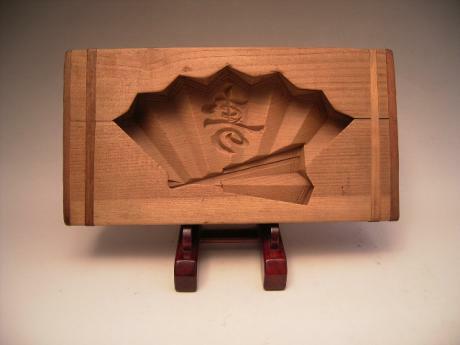 Japanese 20th century wooden mold in the shape of a fan, which the Chinese character, KOTOBUKI, for happiness, for making Japanese OSHIMONO, glutinous rice-flour cakes. The mold's case measures 10 1/4" long, 5 1/4" wide and 1 3/4" tall. 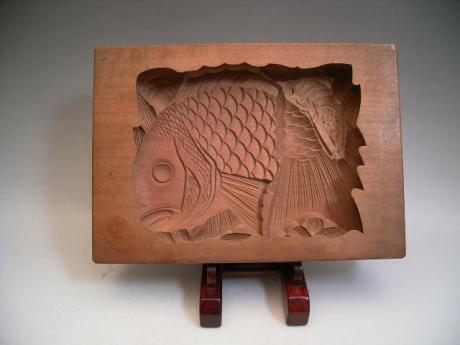 The cake part measures about 7 3/8" wide by 4" tall by 1" ..
Japanese 20th century wooden mold in the shape of a TAI, sea bream fish, bamboo, a clam and a shrimp, for making Japanese OSHIMONO, glutinous rice-flour cakes. The mold's case measures 9 1/2" long, 6 3/4" wide and 1 1/2" tall. The cake part measures about 7" wide by 5 1/2" tall by 1" thick. 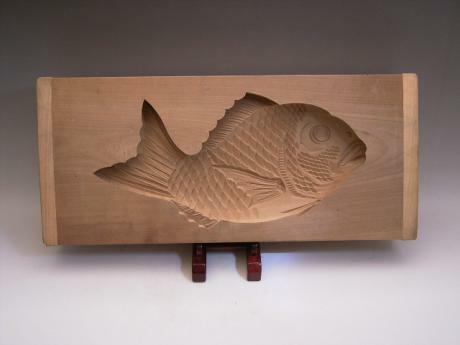 Japanese 20th century wooden mold in the shape of a TAI, sea bream fish, for happiness, for making Japanese OSHIMONO, glutinous rice-flour cakes. The mold's case measures 17 3/4" long, 8" wide and 2" tall. The cake part measures about 12 1/2" wide by 6 1/2" tall by 1 1/2" thick. 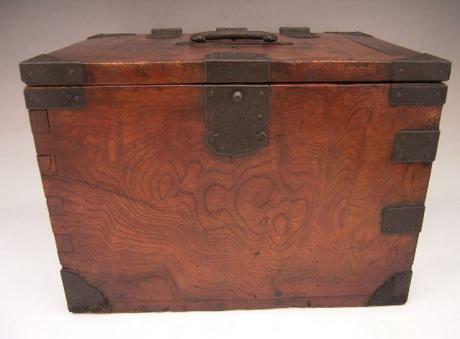 Japanese Meiji Period wooden calligraphy box with hinged top and 3 drawers. The box has the name and address of the original owner written on the bottom of the drawers. The calligraphy box measures 11" long, 7 1/4" wide and 7 1/2" tall. Japanese Meiji Period wooden calligraphy box with hinged top and 3 drawers. Unfortunately all of the information about its previous owners that was written on the bottom of the drawers has been sanded off. The calligraphy box measures 13 1/2" long, 9 1/2" wide and 10" tall. 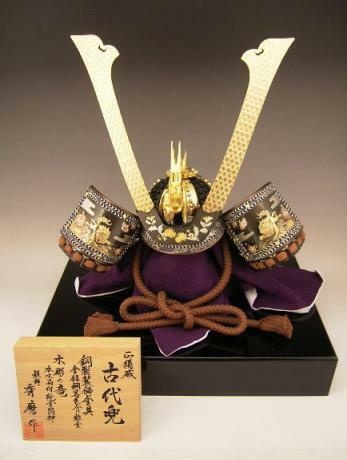 Japanese 20th century Boy's Day Samurai helmet set. Comes with original display/storage black box, wooden stand with purple silk and artist and store signature certificates. the artist signature is also on the back of left "horn" of the helmet. 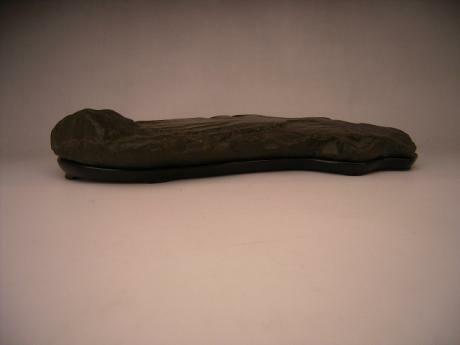 The entire piece measures 26" tall, 16" wide and 13" ..